Rheem tankless water heaters are designed for the homeowners who prefer small, space-saving and compact units that provide on-demand water heating with the continuous supply of hot water. Rheem is the well-known US brand in the industry that has many awards and certifications that meet local and international standards. This review covers the models for residential applications, and it includes the gas- and electric-powered models. There are two types of gas-powered tankless water heaters for residential use and whole house water heating; Professional and Performance line, divided into ultra-efficient condensing and non-condensing models. The Professional series can be found in both the US and Canada, while the Performance line only in the US (these are also known as EcoSense series). 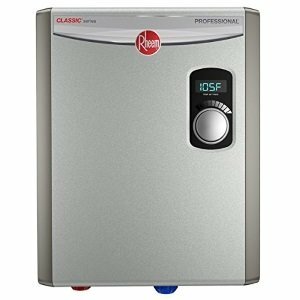 Rheem tankless water heaters from Prestige series are ideal for the busy homes, and families with the high demand for hot water. If you have to use hot water for showers, dishes, and laundry at the same time, or big tubs, this group of heaters is the perfect selection, mainly due to the high water flow and gas input. Prestige series is the most efficient line of all tankless water heaters from Rheem, as the condensing technology increases its efficiency to high 94%, such as seen on these top models. Both Rheem H84 and H95 are built as the indoor and outdoor units; one uses the horizontal or vertical venting system while the outdoor model is ventless. Due to the high energy factor (EF) and low gas emission, Rheem condensing water heaters are "green" and Energy Star compliant that provide significant savings. Condensing technology uses one stainless steel and one copper-made heat exchanger for the ultra high thermal efficiency and longer life. Intelligent electronic controls for improved performance, reliable and safe operation. Hot start programming reduces the fluctuation in hot water temperatures, which increase comfort. High flow rates, with a maximum of 9.5 gal/min, allow sufficient hot water supply for houses with more than 3 bathrooms. The Guardian overheat film wrap is used for additional safety. The EZ-Link cable connects two units into one system for the higher flow rates and power. An option to manifold up to 20 units. Flexible installation, indoor with the horizontal or vertical venting and up to 38 ft. in length, and ventless with the outdoor installation. Indoor units can use PVC vent pipes for more savings. The self-diagnostic system allows for easy troubleshooting. Remote control allows temperature adjustments up to 185 F on some models. 12-year warranty on the heat exchanger and 5 on parts. 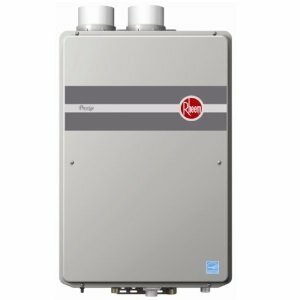 Rheem tankless water heaters from Mid-Efficiency series are found as; RTG series 64, 84 and 95 and can be used from smaller vacation homes with one bathroom to larger homes with several bathrooms. As the condensing series, this group contains indoor and outdoor models. The high efficient design provides the low cost and environment-friendly water heating; small and compact size saves in home space,and computerized board provides accuracy and self-diagnostic. When using the cable connection, two models can be connected into one for more power and hot water supply. Check the prices here. On-demand water heating uses one copper heat exchanger that provides great resistance to the corrosive water action. Ultra Low NOx burner reduces the emission of greenhouse gases. Intelligent electronic controls ensure accuracy and safety. Three models available providing the water flow from 0.26 GPM to a maximum of 9.5 GPM, plenty of hot water for houses with 3 bathrooms. Small, compact size that saves the floor space as it installs on the wall. Digital display of the hot water temperature and the error codes. Hot start programming increases comfort by reducing the "cold water-sandwiches". The Guardian overheat film wrap (OFW) protects from overheating and element failure. Flexible vent installation, indoor as a direct vent or outdoor ventless. 12-year warranty on the heat exchanger and 5 on parts, in residential applications. 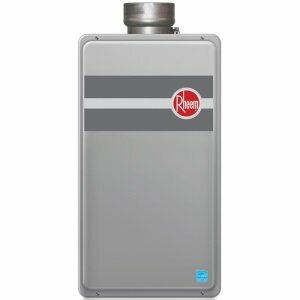 Rheem tankless electric units are used for point-of-use service and are usually installed under the kitchen sink or in the bathroom. These models can also be used in the garage, barns, workshops or offices, or distant sinks. Rheem manufactures several models, from as low as 3 kW to large 27 kW units designed to provide up to 5 gallons of hot water per minute. The main features include the low-flow activation, modulating power, LED power indicator and a 10-year warranty. The Performance line is for US customers only, and it consists of the gas and electric-powered water heaters that are also named as EcoSense. The gas water heaters are designed with and without the condensing technology (mid-efficiency) and basically, have the same features as the above tankless models from the Professional line. Rheem tankless water heaters are an ideal solution for homes and high demanding families, as this technology provides a continuous supply of hot water, efficiently and only when it is needed. The great things about tankless are the use of sophisticated technology, advanced features, and professional grade quality.